So when I learned that Dr. Scott Sampson, the paleontologist on the show, had written a book geared to the adult dinosaur enthusiast, I immediately rushed out to buy it. I spent the next several days tormenting my husband by reading him synapse-popping passages from it while refusing to allow him to borrow it for even one second of reading on his own. Dinosaur Odyssey takes you on a dinosaur-centric tour of the epic of evolution that starts with the Big Bang. The scope of this 332-page book is every bit as expansive as that sentence implies. By page 97, Dr. Scott has treated his readers to clear and entertaining discussions of the Big Bang, geothermal processes, continental drift theory, ecology, evolution, and weather patterns. 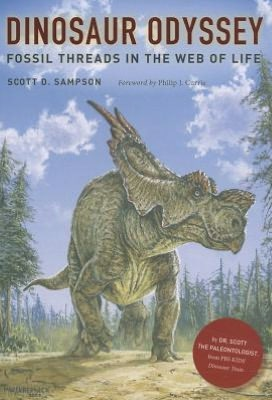 In the second half of the book, Dr. Scott discusses more obviously paleontological topics, including Mesozoic food chains, predator-prey relationships, climate change and its effect on dinosaur evolution, and inevitably, extinction. There’s even a chapter devoted to explaining exactly why Jurassic Park couldn’t happen. Along the way, Dr. Scott weaves in fascinating information about the various dinosaur discoveries paleontologists have made in the past twenty-five years. Take for example, his discussion of plate tectonics in Chapter 4, in which Dr. Scott uses the image of a lava lamp to describe the action of convection forces in the Earth’s mantle (p. 56). Or the passage on p. 31, in which he compares the humble egg to “a portable sea,” the evolution of which during the Carboniferous period 320 million years ago eliminated the need for reproduction to happen in or around water, making it possible for some of the Earth’s earliest inhabitants to live on land. As you might expect, this book is packed full of fascinating facts. Did you know that a single gram of soil can contain 10 billion individual bacteria? That a cubic inch of soil can contain a mile of interwoven fungal matter known as a mycelial mat? That the forest floor under just one of your feet may contain 16,000 invertebrates with 120,000 legs? That four-fifths of all animals on Earth are nematode worms found in soils around the globe? Or that the largest organism on Earth is a 2400-year-old, 1.2 million pound honey mushroom that takes up a three-foot-deep and 3.5-mile-wide swath of land? Fascinating stuff, right? Dr. Scott rather rapidly follows these mind-boggling statistics with the much less savory observation that thanks to the action of a bevy of beetles, ants, earthworms, and even smaller life-forms that break down and recycle organic remains the soil all these beasties live in, the soil in which we grow our food, the very stuff that filters and cleans our water is “best thought of as ‘bug poop. '” Um… yum? Although this book is geared for the adult dinosaur enthusiast, The Four-Year-Old recognized Dr. Scott from the author photo on the back of the book and insisted that I read bits of it to her. Naturally she didn’t understand most of it, but Dr. Scott’s discussion of dinosaur metabolism on p. 226-7 (were Allosaurs warm-blooded, cold-blooded, or something in-between?) and the impact the answer to that question would have on their caloric needs really caught her attention. 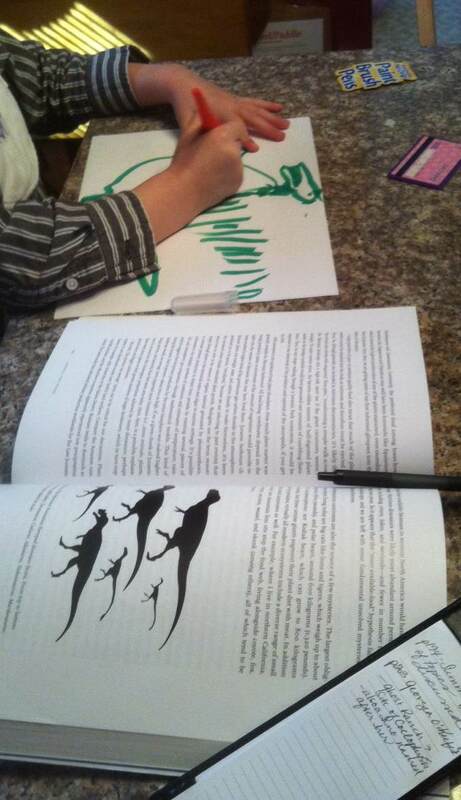 The Four-Year-Old, hard at work on Cretaceous Park, with a little help from the reference text. Pretty much the only downside to this book is the paper it’s printed on. While the lovely heavy paper makes for a wonderfully solid-feeling tome, I wish that paper weren’t so glossy. The gloss reflects the light and forces me to hold the book at a strange angle in order to read it. Next edition, Dr. Scott, think matte finish.